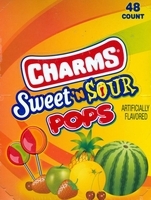 Charms sweet and sour pops have a combination of both a sweet and sour flavors in one sucker. These are unlike many other suckers instead of being round they are flat, however they still have the same great taste you remember. I am sure you remember eating these old time suckers when you were a kid. These have been around since World War 1 and are still one of our top sellers. If you prefer a smaller quantity we also have them in a 10 count bag on our 50's party favors page. 48 Charms sweet and sour suckers per box.